After seeing an article in yesterdays Telegraph on the effect the change in the content of oil fuel is having on the running of AGA cookers I thought I re post my post from a few months ago, problems of oil AGA cookers . As the article in the Telegraph says the problems seem to be localised to some regions and it doesn't appear to be a National problem. Maybe this is to do with the way kerosene is stored – perhaps the new stuff hasn't been started to be used in most areas. Anyway here is an edited update version of my previous post. (England and Wales) Regulations 2007. See Kerosene Sulphur Change The resulting product has a much higher âchar valueâ than before and this will cause your oil AGA cooker to coke up quicker and more often. It may have taken a while for you to notice this and you've probably been living with it blaming it on other things or you've being using the old kerosene stored in your oil your tank and have only bought and used the new stuff more recently.Suppliers have no choice but to provide this new formula kerosene. New AGA cookers work OK with the new oil and a replacement burner is available at a cost to owners of oil fired AGA I'm not sure about Stanley cookers, Esse cookers, Redfyre cookers, Rayburn cookers, Sandyford cookers etc. However if you have an old converted solid fuel AGA cooker (not sure about Rayburn cookers) the new burner does not fit and I've heard that the new burners will cost a bomb. I'd expect these to be the ones with Dons conversion kits. I think because of these the older 'standard' AGA cookers will die out as they will be very difficult to live with.The older AGA cookers that have been converted from solid fuel have always been a nightmare anyway regularly coking up, yellow flame, smoking, going cold when loaded etc. This new fuel with make things worse.My advice if you have an AGA cooker that was once a solid fuel one but has now been converted and you are having serious problems with it is to fit a new AGA pressure jet burner unit from www.tradcookers.co.uk. You may have to buy a new AGA off ebay and then get the unit installed in that one. Or you can get 13 amp conversion kits and get one of those fitted. You will probably have to lose the boiler, if you have one, though. Should I put foil on the bottom of my oven? When I first cleaning some ovens I often notice that the customer has lined either the grill pan or the bottom of the oven with aluminium foil. Often this is coated in grease and smells revolting! People thing that this is a good way to stop the spills, well it may do but it also can cause damage to the enamel of the grill pan and more seriously the bottom of the oven. The reason for this is that the foil reflects the heat back onto the base of the oven and the heat intensifies and gets to a really high temperature and hence causes the damage. I would recommend an oven liner which is a purpose designed and made from PTFE with a teflon coating from a kitchen supply company such as lakeland. This will help protect the bottom of the oven from drips and help you to keep the oven clean. I've had a problem with a Bosch Cooker two days in a row so I thought I do a post on it. 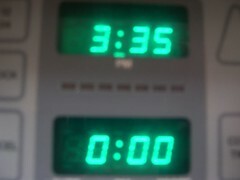 The problem has been setting the clock after switching the oven back on after switching it off. As the bulb had broken off in the main oven for safety's sake I switched the oven off. When I have switched back on I have been faced with just the flashing numbers usually, on most ovens, to reset it's been a case of just pressing the hand button. However in this case I tried every configuration of button pressing I could think of and still the main oven didn't switch on. Somehow yesterday I managed to get the oven to switch on, I must have stumbled on the solution. Today I phoned my wife in the office and she searched on the internet and found out how to do it. So if you are having the same problem here is the solution. The timer knobs will have this configuration: an alarm button then two arrows, and a hand (manual) button, and then a knob to turn. Press both of the arrow buttons at the same time and then turn the knob to set the time, the oven will now operate. That's it nice and straight forward when you know how! Do You Switch The AGA Cooker Off For Your Holiday?